The Smart Witness SVC100GPS-OEM is designed to integrate seamlessly with third party Telematics and Tracking units. It provides critical evidence of events leading up to and during a road traffic accident, and features an Alarm Output and Alarm Input. The Alarm Output is triggered whenever the unit detects an incident/accident via its shock sensor. This output can be connected to a Telematics or Tracking unit, so that a real time notification of the incident/accident can be sent instantly. The Alarm Input can be connected to an Emergency/Panic Button or other device. When this input is activated an Alarm Output trigger is generated. Evidence recorded by the SVC100GPS-OEM can protect a driver from many of the issues faced on the roads today. Designed for semi-professional installation, the SVC100GPS-LC attaches to the inside of your windscreen using a similar high strength adhesive pad to that used for attaching rear view mirrors. 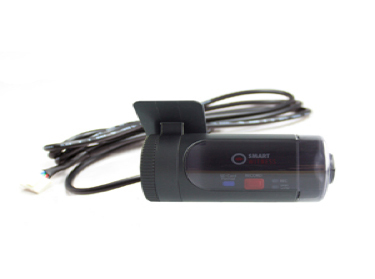 The unit is hard wired to the vehicle's battery, and includes a locking transparent cover, which prevents unauthorised access to the SD card or operation buttons. It is small and unobtrusive, and is designed to look like it is part of the vehicle, preventing any unwanted attention from passengers or passers by. In the event of an incident/accident occurring, the keyholder can simply remove the SD Memory Card from the unit and plug it in to a Windows PC using the included USB SD Card Reader. You can then playback, search, backup and email recordings, using the Smart Witness Analysis Software provided. The SVC100GPS-OEM is the integration enabled version of the SVC100GPS, the world's most popular Vehicle Accident Camera. It is designed for integrating with third party Telematics and Tracking units. Embedded 256 level Bosch G-Sensor for accurate reporting of G Force levels present in an incident/accident. Records Driving Style, by continuously monitoring the effect of speed, acceleration, braking and steering on the vehicle. 31 day Vehicle Tracking History, showing vehicle location, speed and driving style. Built-in battery back up allows the unit to finish recording even if the power supply is interrupted during an incident/accident. Visual Driving Style Indicator automatically detects poor driving style and alerts the driver via a visual alert on the unit. For connecting third party triggering devices, such as an Emergency/Panic Button, an Alarm Input is provided. Manufactured using light weight polycarbonate, keeping the unit small and light. Adjustable bracket with unique non slip design, even under extreme vibration. Data Protection Act compliant, court admissible recordings.